An electrifying album of guitar-driven blues rock from the classic British Blues era of 1965-1970. 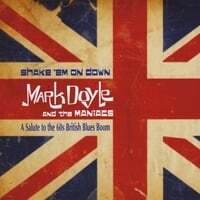 Created as a way to preserve and respect the great music of the British Blues Boom era of the Sixties, Mark Doyle & The Maniacs is the brainchild of guitarist/producer Mark Doyle. Signed to RCA in the early ‘70s with his first band, Jukin’ Bone (who played their own brand of fiery, Anglophilic blues rock), Mark has gone on to record and tour with artists as varied as Meat Loaf, Bryan Adams, Judy Collins, Leo Sayer, and Hall & Oates. A visit to the Discography page on his website details the 65 albums that Mark has been involved in. So take a wild ride that starts with Them’s “Mystic Eyes” and passes through The Yardbirds, Fleetwood Mac, Savoy Brown, and John Mayall, ending with Robin Trower (technically past the era, but evoking it nonetheless.) Along the way there is one original song by Mark and his old Jukin’ Bone bandmates George Egosarian and Joe Whiting, “New Set of Blues,” which is meant to conjure up the spirit of the era. Turn it up and Shake ‘Em On Down! It is so refreshing to hear passionate blues rock again. If styles come back around in circles, I can only hope that it's time again for this music! Mark Doyle's tone and playing are incredible. I'm so tired of the overly compressed, fast scale playing that passes for "guitar heroes" nowadays. Mark understands that is about emotion, expression, and truth. These songs are not "tribute band" covers. They have been re-worked and re-interpreted to give them a fresh sound while still being true to the original versions. The band is top notch and the drummer, Frank DeFonda, is an absolute animal! Lastly, the production quality is also an auditory delight. It was done live in the studio and captures the immediacy of the music. It sounds as if it was recorded at Chess Records in 1964, with Brian Jones engineering! The energy and excitement explode out of the speakers. As they say in England: "Well done mates!" This is one of the best tribute albums you will ever hear. Mark plays homage to the British bands that influenced him and the music that made Free Will a joy to listen to. Mark's band is one of the best he's ever played with and they capture the spirit of the sixties British blues and then some. Mark's playing is amazing on this and Terry Quill's harp playing will blow you away and his wah-wah playing on Sandy Mary. This one rocks from start to finish and doesn't let up. If there is ever to be a band from the Syracuse area that goes National or even International, I guarantee you it will have Mark Doyle’s name on it. He put together a group of seasoned musicians that inevitably were welded together. I witnessed Mark Doyle and the Maniacs “Shake’em Down” live on the TK 99 and Blue Moon Café Stage at the “Taste of Syracuse” weekend. Jack Lipton’s graveled voice is true blues fashion, deep tenor and he has the stage presence of the Big Bopper. Terry Quill ripped it up on the harp and is also a consummate guitarist adding a real groove rhythm to the group. As for Mike Ryan, his soul was manifested through his surprising great vocals and driving bass lines. Frank Defonda expressed his love for the skins with his typical amazing drum licks. After hearing,.... experiencing the maiden voyage of this “Great Group” it occurred to me as I walked away, all the other acts should have opened for Mark Doyle and the Maniacs. They need to be in the public eye more…..A HELL OF A LOT MORE! Relentless in the best sense of the word! Just as masterful and moving as the bands it invokes, hits all those sweet spots over and over and adds new ones along the way. All the sheer energy, ineffable blues sensuousness and raw power you can take. Another word that has to be mentioned is authentic—these guys ain’t no pretenders. It’s like a Master Tour of the Greats—-yesterday’s and today’s. Mark and his Maniacs well deserve to stand alongside their heroes—-this CD brings out the best in them all.